iTerm2 has a collection of shell scripts that help you take advantage of some of its unique features. When you install Shell Integration from the iTerm2 > Install Shell Integration menu, you're asked if you'd like to install the Utilities Package as well. This page describes these utilities. If you prefer to install only the utilities (without also installing Shell Integration) you can find them here. Most of the utilities work without Shell Integration. The imgcat program displays images inline in your terminal. It supports all standard image formats, including animated GIFs. Lists the files in a directory with thumbnail previews for images. Requests attention. Can bounce the dock icon or show a fireworks animation at the cursor position. 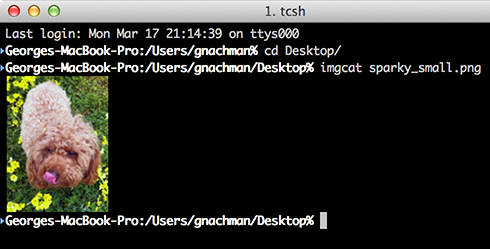 Checks if the terminal emulator is iTerm2. Copies text to the pasteboard. Works over ssh. Accepts either standard input or a named file. For this to work you must enable Prefs > General > Applications in terminal may access clipboard. The it2dl program downloads files. This is useful when you are ssh'ed to a remote host. The downloaded files are placed in your Downloads folder. Fetches a session variable. For a list of session variables, see the Badges page. Configures touch bar function key labels. Saves the current labels with an optional name. Resets labels to their default value, unless name begins with a . character. If name is given, all key labels up to and including the one with the matching name are popped. Recommended usage for customizing an application is to set key labels and then push with a name of a concatenation of the app's name (e.g., "emacs") and a random number. When the app exists, pop to that same name. Uploads a file. Works over ssh. If given, the destination specifies the directory to place downloaded files. Further options are passed through to tar. See your system's manpage for tar for details. Sets the unicode version for the current session. The key difference is that unicode 8 and unicode 9 use different width tables for emoji. Most apps aren't updated to use the unicode 9 tables, but Unicode 9 produces nicer results with fewer overlapping characters. Saves the current version with an optional name. If name is given, all versions up to and including the one with the matching name are popped. The Utilities Package places shell scripts in $HOME/.iterm2/ and creates aliases to them at the bottom of $HOME/.iterm2_shell_integration.$SHELL.